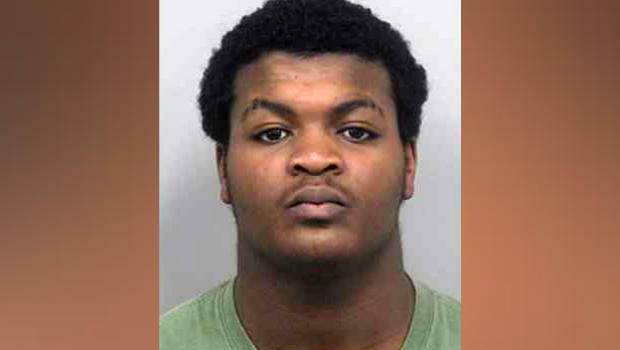 SNELLVILLE, Ga. -- Authorities said they're continuing the search for the second of two teenage suspects in connection with the fatal weekend shooting of a police officer near a school northeast of Atlanta. Authorities said Sunday they believe 18-year-old Tafahree Maynard fatally shot Officer Antwan Toney a day earlier as he checked a report of a suspicious car parked near a school in the Snellville area, Gwinnett County Police said in a statement. Maynard remained at large early Monday and should be considered armed and dangerous, police said. He faces charges of aggravated assault and felony murder. "Tafahree Maynard needs to turn himself in," Gwinnett County Police Chief Butch Ayers said at a weekend news conference. Police said Maynard wasn't at a Gwinnett County house Sunday evening where a SWAT team deployed to serve a search warrant for him. Three people who were in the home were being questioned by authorities, reports CBS Atlanta affiliate WGCL-TV. An official statement appealed to the public for tips leading to Maynard's whereabouts. A second suspect, 19-year-old Isaiah Pretlow, was charged with aggravated assault for allegedly pointing a firearm at an officer during the pursuit after Toney's fatal shooting, police had said earlier. Toney died at a hospital over the weekend from his wounds, police said. The 30-year-old from Southern California had been with the Gwinnett County Police Department for nearly three years, serving in his first police job. Toney and other officers initially responded to a call about a suspicious vehicle near a school, police said. When the officers approached, someone in the vehicle opened fire and Toney was hit. Then the vehicle sped off. According to police, Pretlow drove the vehicle away after the shooting, crashed a short distance away and fled along with three other occupants, WGCL says. An officer searching the area later encountered Pretlow about 3 p.m.
Pretlow pointed a gun at the officer, who fired shots, according to a statement. Pretlow wasn't hit and fled into some woods. He was subsequently taken into custody by U.S. Marshals. Toney's sister, Carla Johnson, says moved to Atlanta from California specifically for the job with Gwinnett County. She says she spoke with him just before he went to the suspicious vehicle. The two were making plans for the holidays. "I talked to him as he was pulling up to the call," Johnson said on a FaceTime call with WGCL. "During that call, the radio call came through and so I wrapped up, and he said, 'Okay, I've gotta go. I've got to take this call. I'll call you right back.' It's the last time I talked to him. The next call I got was from his lieutenant telling me what happened." His family says Officer Toney was living his lifelong dream. "Antwan wanted to be a cop since we were children," Johnson said. "He is the only person I know that knew what they wanted to do at 4-years-old. He had police cars that he used to play with, probably well into his teens, and his police figurines. He knew he wanted to be a police officer." Officer Toney's sister says he loved helping steer children in the right direction. A viral video shows him playing a pick-up game of basketball with a group of neighborhood children. His sister says he was the life of the party, generous and had a huge heart. "He wanted to be that person to bridge that gap between the law enforcement and the community and show that there are good guys and he was one of them," Johnson said.